Helsinki, Finland – Feb 7, 2011 – Synble Ltd., creator of innovative localization solutions and mobile software, has today released its new generation community service for developers and translators, Get Localization (http://getlocalization.com/). This revolutionary service makes localization easier than ever before for software and web development companies. The market and demand for localized software is growing rapidly. Apple App Store is available in 90 countries and Android Market in almost 50. However, applications are mostly created in English only, regardless of the country where they are developed, leaving large market areas not fully catered for. Numerous web sites can still only be found in a very limited selection of languages. Get Localization changes the localization process by offering an easy and intuitive cloud service for developers who can now start their localization project in a matter of minutes. The service gives developers the opportunity to choose the way of localization that is best suited for their needs. In addition to the traditional approach with localization through professional translators, the developer can choose to engage the user community and crowdsource the translation, or go with a combination of these two. A broad service offering allows to meet the needs of large enterprises as well as self-employed developers. 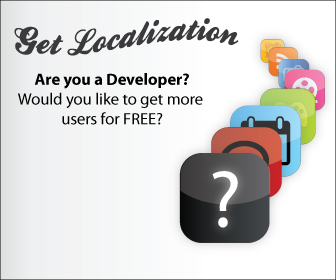 Get Localization has ideal tools for crowdsourcing localization to the user community. By translating, voting and commenting, the community can easily help their favorite applications gain new grounds. The user interface for translators is very intuitive and extremely easy to learn but still offers powerful productivity aids. This makes it very easy for a new user to get started and helps the user community in creating excellent translations. One of the numerous projects to have benefited from Get Localization already in beta stage is the all-in-one sports and exercise assistant runtastic for iPhone, Android and Blackberry. After carefully examining available services and the app user community, runtastic decided to engage its users with Get Localization. – Easy uploading for developers, no need for any file conversions for iPhone, Android, Ruby on Rails and numerous other formats. – Crowdsourcing made easy, as the intuitive translation interface will allow translators to start translating within minutes. Professional translators will recognise core functions of CAT-tools now transformed into a cloud based solution.